Opposition from elected officials led DOT to significantly reduce dedicated bus lanes. Call it Marty Golden’s revenge — against his own bus-riding constituents! After months of back-and-forth with the Bay Ridge senator and a cadre of other parking-obsessed electeds, the Department of Transportation and the MTA will finally launch its B82 Select Bus Service in southern Brooklyn on Monday. DOT significantly scaled back the ambitious Gravesend to Canarsie line at the behest of Golden and seven other city and state elected officials who were upset that 134 parking spots would be removed to make way for dedicated bus lanes on the Kings Highway portion of the route. The agencies tweaked the plan, which will remove about 100 spaces for car owners to store their private property in the public right-of-way. Another change that watered down the Kings Highway stretch: DOT previously planned to install 28 blocks of dedicated bus lanes. Now, there will be only eight. So call that a win for Golden and company, but all they have done is undermine the city and state effort along the B82, which crawls at less than 5 mph along the most congested portions of Kings Highway, where double-parking forces buses to weave through traffic. Perhaps as a consolation for the B82’s average 28,000 daily riders, bus lanes will be in effect seven days a week, from 7 a.m. to 7 p.m., except between East 23rd Street and Avenue K, where they’ll be 24/7. The original plan only called for six hours of bus lanes, and only on weekdays. And the Select Bus Service will include off-bus ticketing and all-door boarding to reduce stop times. After three years of community meetings and public feedback, B82-SBS was initially set to launch last spring. Then Golden and company got involved, arguing without evidence that the line would cause “permanent damage to retailers and businesses” — as if driving was the best and only way to access this completely gridlocked commercial corridor. In addition to Golden, the SBS opposition included State Senator Simcha Felder, Assembly Members William Colton, Steven Cymbrowitz, and Helen Weinstein, and Council Members Chaim Deutsch, Kalman Yeger, and Mark Treyger. Throughout the debate, elected officials made it immeasurably clear that their primary concerns were with motorists and their access to car storage in the public right-of-way, not the transit-riding majority’s ability to get around. In April, Colton argued, bizarrely, that the six hours of bus lanes were “anti-women,” because women need to drive to Kings Highway in order to support their families. More recently, City Council Member Jumaane Williams, in the middle of his statewide campaign for lieutenant governor, joined the fray to amplify the complaints of one man upset over the placement of a bus stop outside his home. In a statement to the Brooklyn Eagle, Colton hailed the modified plan as a victory — to hell with the thousands of bus riders he forced to wait months longer for service improvements. Meanwhile, transit advocates are forced to accept half a loaf. Southern Brooklyn is starved for reliable public transit. The launch of B82 SBS is a long-awaited win for residents of Brooklyn who rely on public transportation. I’m pleased to see that the MTA responded to initial concerns raised about this proposal and still found a way to make SBS a reality. This is an exciting milestone for commuters in Southern Brooklyn but we have so much more work to do to improve our public transit system. The reality is our current state senator opposed this project and has done more advocacy to make it harder for riders with disabilities to get around the city than he has to make real capital improvements to our MTA. Riders are tired of waiting and want a representative who is committed to improving Southern Brooklyn’s public transportation system and will fight for better bus and subway service that responds to the needs of all. 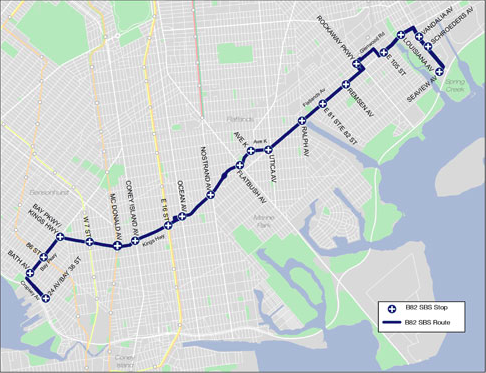 More information about the forthcoming B82 launch, and a full list of stations, is available on the MTA’s website. Reading Gounardes statement… I don’t at all see similarities between he and Golden’s contempt for the project. Being pleased to hear the MTA took feedback is far from suggesting he joined the chorus of knuckleheads trying to kill better bus service. I agree with Paco’s reading – putting Gounardes in the Golden camp doesn’t feel like a fair reading of the 2 statements, or of their views on transit.